Pema Khandro is a Tibetan naturopath and a teacher of Tibetan Buddhism. She is the founder of the Yogic Medicine Institute, a natural health clinic and school which trains health educators to incorporate principles of holistic living based on the healing sciences of India and Tibet. Pema Khandro’s primary work with Tibetan Medicine is to emphasize its teachings and practices as key component for personal transformation. Her message is that without also caring for the body, it is impossible to fully train the mind. Pema Khandro is also an authorized Lama and lineage holder of the lineage of Buddhist Yogis in the Nyingma and Kagyu lineages. She is the founder of Ngakpa Intl, a school which offers in-depth education in Buddhist philosophy and practices. Pema Khandro’s study of Tibetan Medicine and Tibetan Buddhism began when she learned Buddhist philosophy and meditation when she was five and actively practiced until her mid-teens, at which point she began to also pursue training in yoga and healing traditions. After learning about cruelty to animals, when Pema Khandro was a teenager she became a vegan and has been an advocate of vegan lifestyle, organic foods and sustainability ever since. Her organization and centers are committed to relying on non-toxic, renewable and sustainable resources. The courses she offers emphasize the relationship between inner and outer ecology and the importance of connecting with nature. Pema Khandro’s education then focused on Ayurveda, Tibetan Medicine and Yoga traditions, receiving certifications as an advanced yoga teacher in three different systems and as a yoga therapist, later teaching yoga, meditation and training yoga teachers. This is what led her to learn Ayurveda and Tibetan Medicine, which she studied in India, Nepal, North America and Europe. Her main teachers of Ayurveda and Tibetan Medicine were Drs Naram and Dr Pasang. In Tibetan Buddhism, teachers are given names and titles during refuge vows, initiations, and ordination. She was given the title Pema Khandro Rinpoche after being enthroned as the reincarnation of a nineteenth century Tibetan Yogini in the Nyingma and Kagyu lineage. Pema Khandro Rinpoche’s long time study of Buddhist philosophy and history also led her to pursue scholarly study of of Tibetan Buddhism. She is currently a PhD candidate at the University of Virginia where research focuses on Dzogchen and Nyingma history. In 1999, Pema Khandro Rinpoche founded Ngakpa Intl, opening a public center, the Yogic Medicine Institute clinic and several residential training facilities in Southern California. The headquarters later moved to Santa Cruz and then Berkeley California. The main residential center is in downtown Berkeley, California and is known as the MahaSiddha Center. For more than a decade a yearly project of Pema Khandro’s community and friends is Ngakpa House. This is a foundation that fundraises in order to offer practical support for food, lodging and education for children and elders in the Himalayan border regions. Pema Khandro developed a school within Ngakpa International along with her friends and students who first joined her in 1998 – 2000, most of whom are still with her to this day. As the community has grown, several of her students serve their local communities as YMI Faculty, senior practitioners, teaching assistants and instructors of classes in meditation and introductory courses on Buddhist teachings. In 2003, Pema Khandro Rinpoche also opened a multi-level training program through which specific levels of the path and teachings are presented to make available the whole scope of the Buddhist teachings from the ground up through to advanced practices. 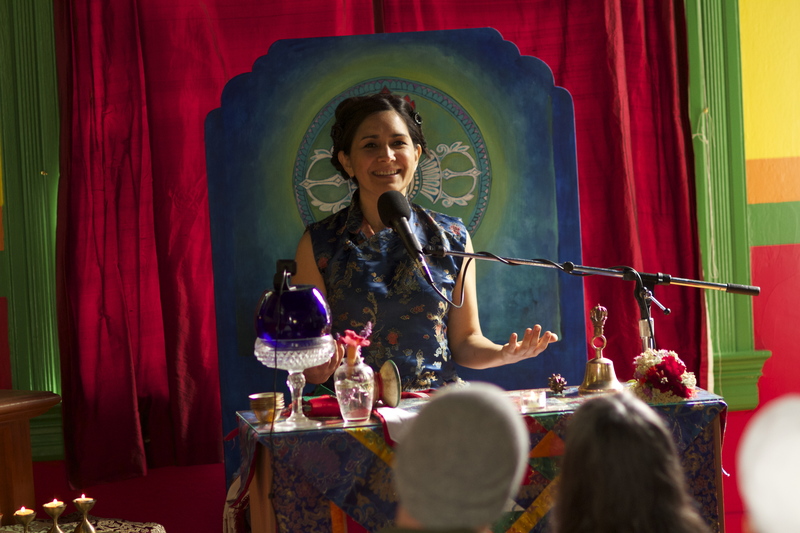 Through the Vajrayana Training and the Ngakpa Seminary, Pema Khandro continues offering long term Buddhist education for serious students. Regular teachings are also web-cast to students and friends all over the U.S.
Pema Khandro has been featured in Lion’s Roar Magazine, Buddhadharma Quarterly, Yoga Journal, in TV and numerous radio interviews and continues to be an advocate of the relevance of non-monastic Buddhist traditions as Buddhism takes shape in North America.